Confessions of a cat lady….. I know that one of the heartbreaking things that “can” happen to weight loss surgery patients is hair loss. Apparently it is only temporary and lasts about 3 months. I am not sure what the statistics are as to how many patients actually experience this, but the thought of my hair thinning is horrifying to me. I have baby fine hair as it is. It isn’t thick to begin with and I just am scared that I will look like that creature from Lord of the rings….My precious. Boo! I have thought that if it “does” happen to me, I can look into getting a weave, wearing head bands or rocking some wigs. 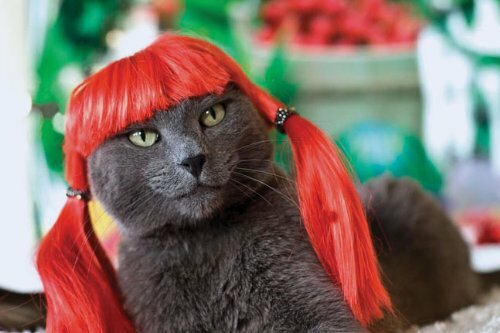 Maybe I can just get super funky brightly colored wigs and not giving a care to what others think. It is supposed to only be temporary, but I just that it doesn’t happen to me. I guess getting healthier does have some drawbacks! I am only 2 weeks post op but I have not had any hair loss at all to date. Get the dissolvable biotin and start now- it will help. Hi! I love my 5 cats almost more than anything. I am addicted to mint Chapstick and Robots. I am recently married. Welcome to my neck of the woods!